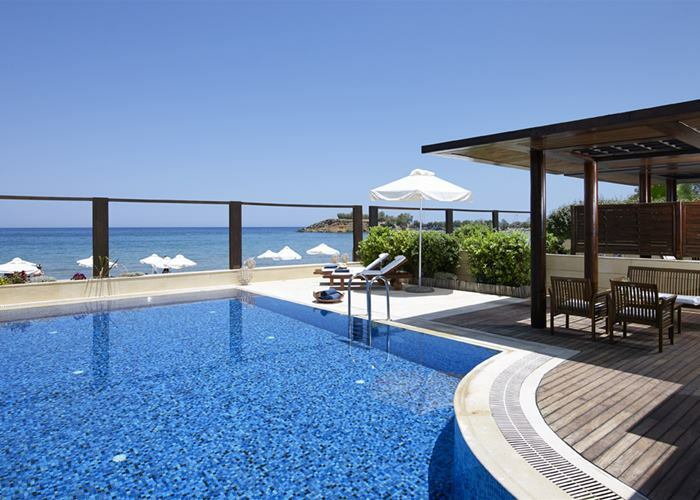 Beautifully located on the sandy beach of Agioi Apostoloi with stunning views from around the resort, the hotel offers luxury accommodation and a relaxed environment that every adult desires on holiday. Promising unique moments of relaxation and designed with couples in mind, our stylish harems and Gazebos around the refreshing pools are just one of the features giving you the reason to re-live your romance. The hotel is ideal for couples above the age of 16 years old. 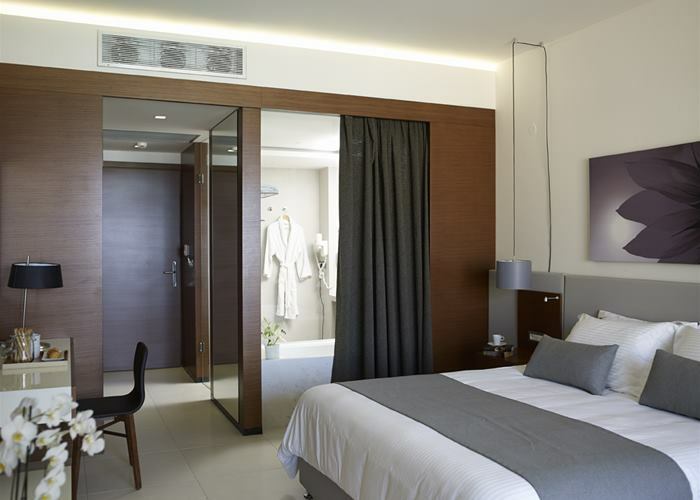 These elegant rooms are designed in contemporary style, with light wood furnishings, a queen bed (twin beds option available) for maximum comfort and a balcony. Sleeping up to 2 people the room is complete with mini fridge, plasma TV and air conditioning. 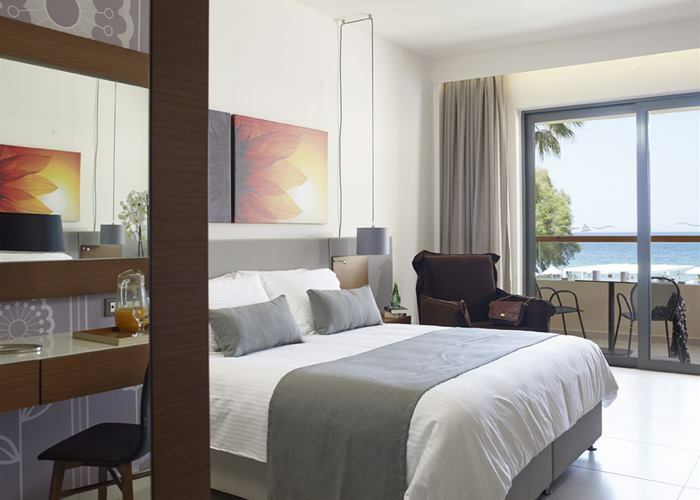 These elegant rooms are designed in contemporary style, with light wood furnishings, a queen bed (twin beds option available) for maximum comfort and a balcony to enjoy magnificent views. Sleeping up to 2 people the room is complete with mini fridge, plasma TV and air conditioning. 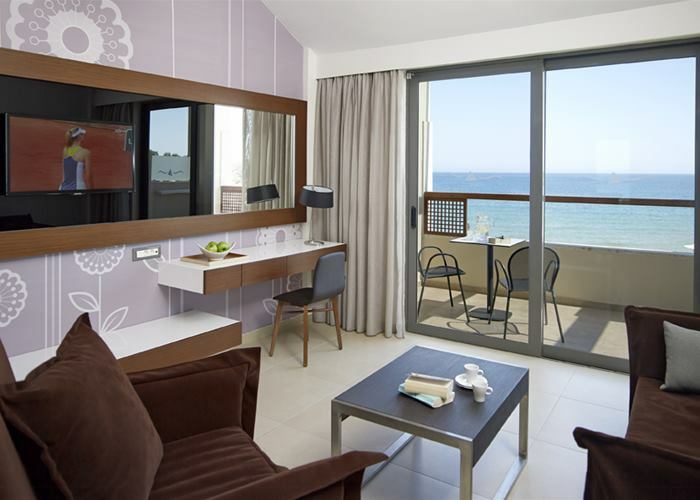 The stunningly breath taking view of the double Jacuzzi sea view rooms, is one of the main calling cards of this elegant and well-appointed rooms. 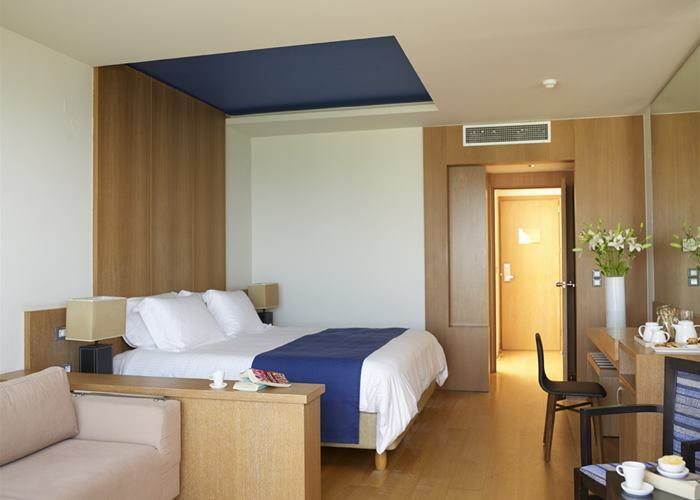 These spacious and airy rooms boast of a queen sized bed draped in fine linens and modern contemporary décor finishes. Sleeping up to 2 people the room is complete with mini fridge, plasma TV and air conditioning. There's something amazing about being able to swim to your room rather than walk to it. Double rooms with swim-up pool’s display a real sense of class with plenty of light and the added bonus of a sharing swimming pool right up to your terrace that's complete with sun loungers, a wooden deck and table with chairs. The rooms sleep up to 2 people with a queen size bed, mini fridge, plasma TV and air conditioning. 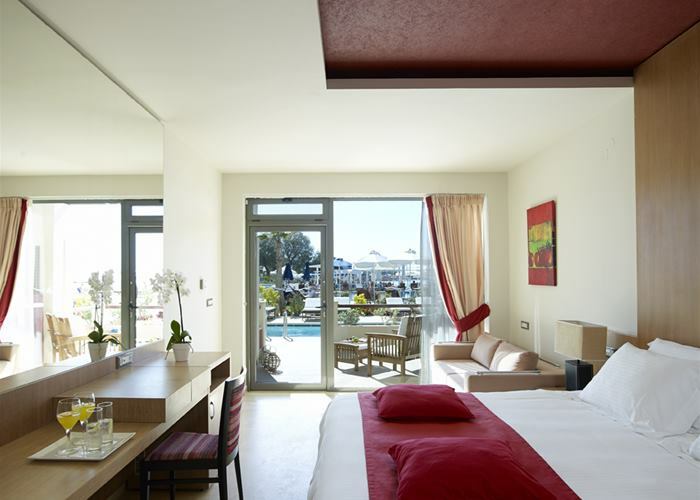 Important Note: Double Sea view swim up rooms with contemporary design and wooden furnishings offer sun loungers. 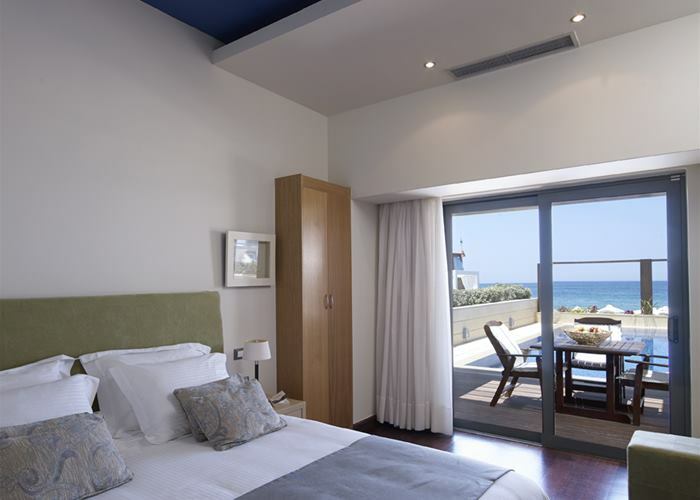 Double Side Sea view swim up rooms with sophisticated style, clean lines & soft grey tones offer wooden decks or sun loungers. There are but a handful of truly extraordinary luxury accommodations that elevate a vacation and this room is just one of them; beautifully furnished room with an inland view. Sleeping comfortably up to 3 people the room is complete with mini fridge, plasma TV and air conditioning. There are but a handful of truly extraordinary luxury accommodations that elevate a vacation and this room is just one of them; beautifully furnished room with a view looking over the sea. Sleeping comfortably up to 3 people the room is complete with mini fridge, plasma TV and air conditioning. Think contemporary with a hint of luxury and you're already there. 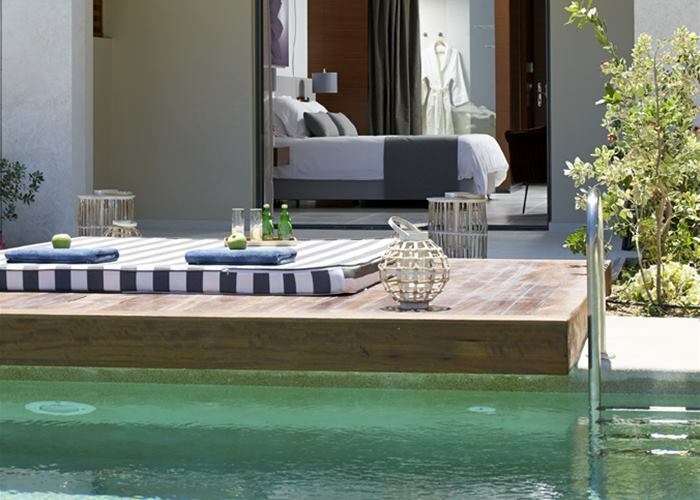 The most amazing feature of these rooms is that you can dip right into the sharing pool in front of your shady terrace. Sleeping up to 3 people the room is complete with mini fridge, plasma TV and air conditioning. This room is available with sea view only. 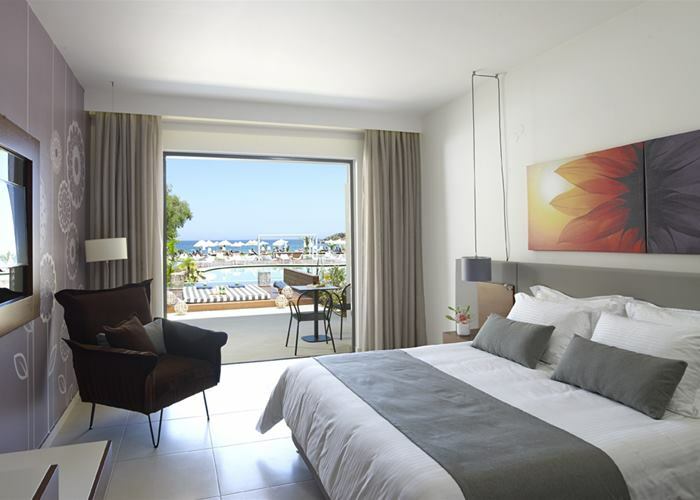 Important Note: Rooms can be found both with contemporary design, wooden furnishings offering sun loungers and with sophisticated style, clean lines & soft grey tones offering wooden decks or sun loungers. There's nothing like dipping your toes first thing in the morning in the sharing pool brought right up to your terrace complete with private sun beds or wooden deck. The rooms sleep up to 3 people with a queen size bed, mini fridge, plasma TV and air conditioning. There’s a real hint of class within these elegant maisonette rooms. 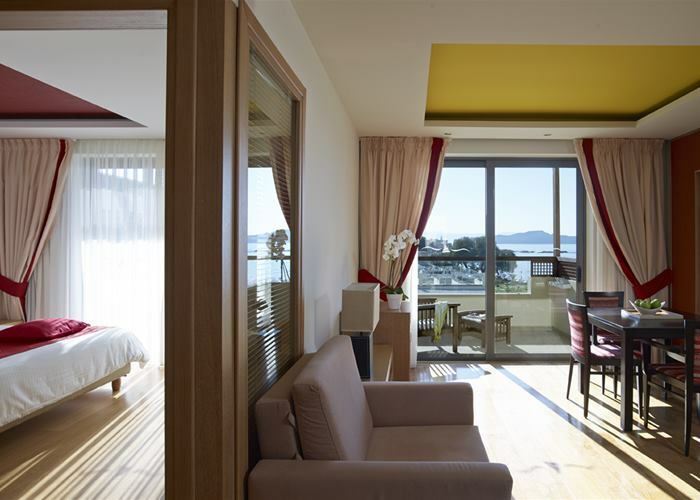 A comfortable living area accommodates the entrance level that opens out on to the balcony with direct full sea view. A staircase then leads to the spacious bedroom area. 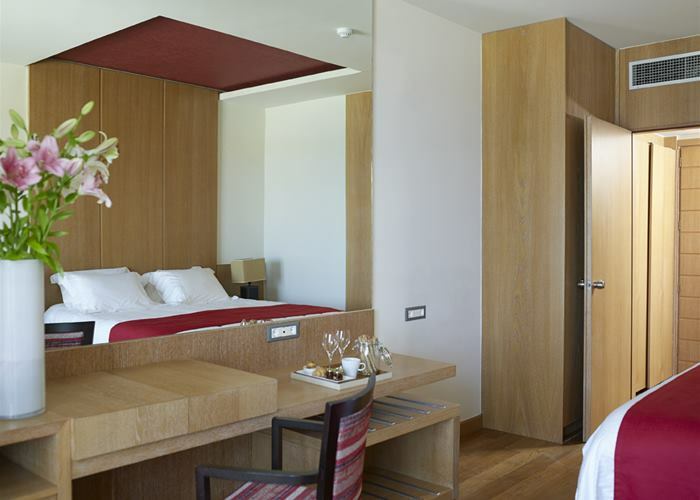 The rooms sleep up to 3 adults, with a queen size bed, mini fridge, plasma TV and air conditioning. Bold and bright, these comfortable rooms with astonishing sea views and a separate living room area will greet you at every turn. Sleeping up to 4 people the room is complete with mini fridge, plasma TV and air conditioning. This room type heads up our collection with a stylish yet elegant decor. 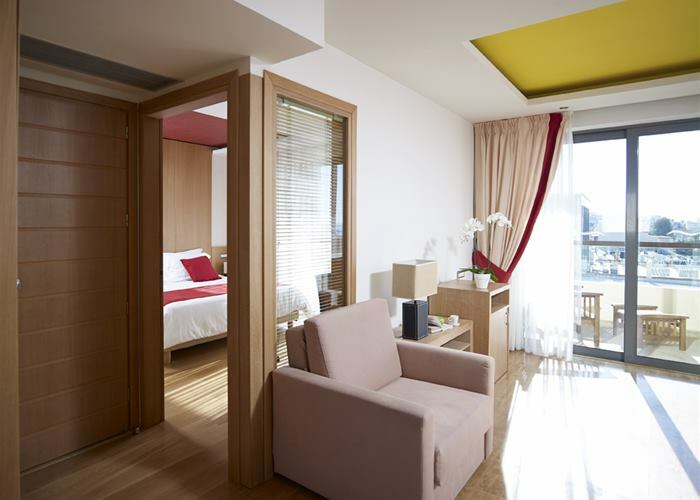 Space has not been questioned in these large suites that easily sleep up to 4. The master bedroom has a queen size bed and a living room that easily doubles up in to a second sleeping space. There are also other essentials like hydro bath, a mini fridge, plasma TV and air conditioning. 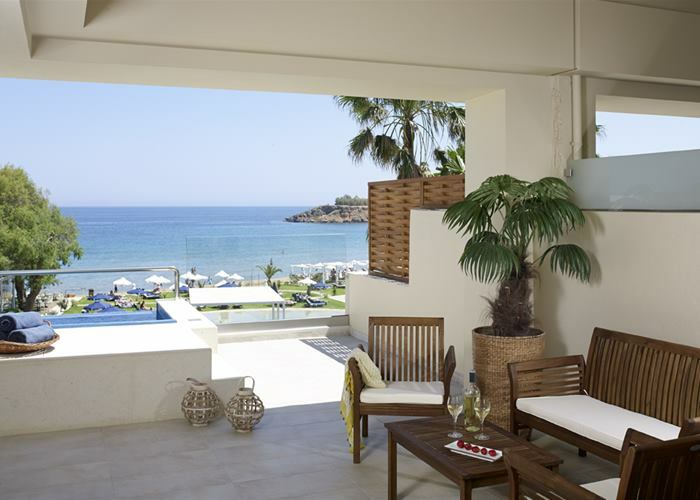 What’s more is that these rooms are situated at beachfront with stunning sea views and come with their own private pool. The spacious terrace with private pool will guarantee privacy, tranquility and most definitely relaxing moments not easily forgotten.